Plane strain transformation calculator is used to calculate normal strains and shear strain at a specific point for plane strain state (εz=γzx=γzy=0) after the element is rotated by θ around the Z-axis. If the plane strains are known for a specific point on a member, then plane strains for different orientation (in the same plane) can be calculated with this calculator. Plane strain is a state where normal and shear strains occur within a plane and no strains occur perpendicular to this plane (εz= γxz = γyz =0). This situation occurs in a plate subjected along its edges to uniformly distributed loads and restrained from expanding or contracting laterally by smooth, rigid and fixed supports. 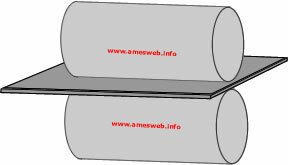 An example to this can be rolling of the sheet metal between rollers. In this situation, expansion of the metal is constrained by rollers in perpendicular direction. The formulas used for plane strain transformation calculations are given in the "List of Equations" section.